Inspired by Jamie Olivers’ recipe (although I’m sure he’s not the first to do it, his is the recipe that I looked at!). Great for a Sunday lunch (which this was) minutes of preparation at the start and then just leave it on a low heat in the oven or barbecue and it’s ready 4-5hrs later. No basting, turning or checking required. It really does just fall off the bone when it’s done and I used two forks to ease the meat apart and serve at the table. I’m planning on using the leftovers to make a little lamb ragu. 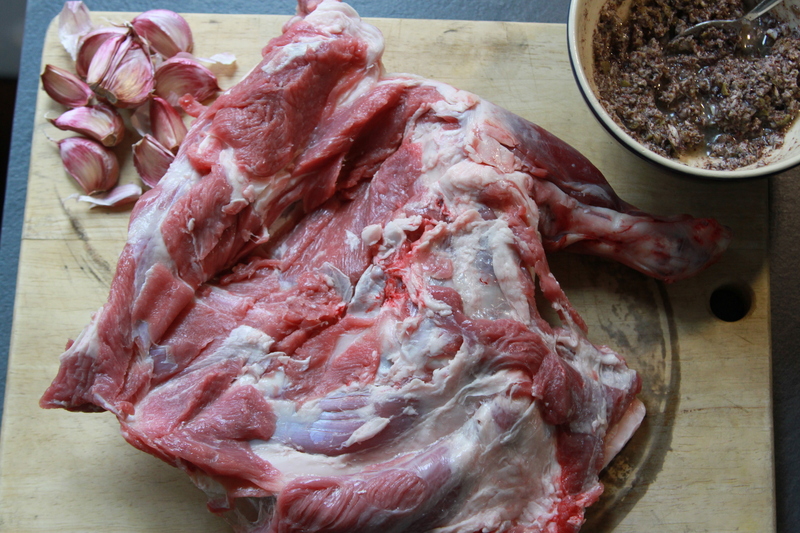 Lamb shoulder (bone in). – On request, my excellent butchers, Bashford & co, very kindly trimmed the end of the bone (like a french trim). They also butterflied the meat a little, while leaving it on the bone, so that there was a larger surface area to sear and spread the marinade onto. 1 bulb of garlic, separate the cloves out, but don’t peel them. Heat the barbecue up for about 10mins, lid down, on full heat. Aim to get the heat inside to above 250c. Make the marinade: put the anchovies and olives in a food processor and blend. Add the salt, pepper and oil and mix well. Flatten the joint out on a chopping board as much as possible and rub with some olive oil (nothing too expensive as you’re going to cook the hell out any delicate aromatics!). Sear the meat on the barbecue until it just begins to brown but not burn (about 5mins on high heat). Then turn it over and sear the other side. Remove the joint on to the chopping board and turn down the heat on the barbecue. Smear over the marinade onto both sides, spread out the garlic cloves and put the sprig of rosemary in the middle. Now roll it back up as much as possible and wrap it well in foil – I used two layers. Place the wrapped meat at the back of the barbecue and turn off the burner directly beneath it, leaving on the one further away. Close the lid and aim to keep the temperature at about 150c. Come back about 4hrs later, but i think that it would be pretty forgiving if you came back an hr later than that! Carefully place the wrapped meat on a board and leave it for 30min with a dry towel on top to rest. Unwrap and serve. We had this with grilled bread, hummus, olives, tabbouleh and a tomato and pomegranate salad.